This post is about the Amazon Fire TV setup, we will show you the process of setting up your Amazon Fire TV and provide some reviews on the device. 2 aaa size Amazon brand batteries. If you are from countries like Singapore, Malaysia and Indonesia, most concerning question you may ask before purchase will be “Does Amazon Fire TV supported in the countries using the 240V current?” We took a picture of the its power adapter so that you can look at its specifications. Watt:16W, Input: 100-240V – 0.5A 50/60Hz, Output: 6.25V~2.5A. So, this in not a concern anymore. The hardware setup is very simple, you need to have a HDMI cable, which is not included in the package, you can order one for under US$10 when you buy the Amazon Fire TV. Just connect the HDMI cable to the HDMI port behind the Fire TV and connect the other end to your TV's HDMI port. Connect the device to the power point and switch on the power. On your TV, select the HDMI video source to begin the Amazon Fire TV setup. Placing the remote closer to Amazon Fire TV. Pressing the home button on the remote for 5 seconds. Inserting fresh batteries into the remote. First, it will ask for internet connection. Use the navigation button on the remote controller to perform the selection and enter your network password. After the internet connection is successfully established, it will check if your Amazon Fire TV needs any software update. If your Amazon Fire TV needs an update, do not disconnect from the network or unplug the power cable while it downloads the update. Once the update is completed. Your Amazon Fire TV is now ready. If you have purchased the Amazon Fire TV under your own Amazon account, then the device is already pre-registered to your Amazon account. If not, you just have to login with your Amazon account and it will auto register the Fire TV to your Amazon account during the Amazon Fire TV setup process. “About Free One Month Amazon Prime Membership. After the Amazon Fire TV setup is completed, it will start with an animation presentation to guide on how to operate the Amazon Fire TV. The Amazon Fire TV interface is quite simple and neat. The menu is on the right side of the screen, and the menu contents are on the left. 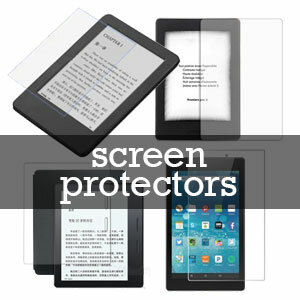 The menu consists of: Search, Home, Movies, TV, Watch-list, Video Library, Games, Apps, Photos and Settings. Amazon Fire TV setup screen. We did a simple test on network connection without VPN and network connection with VPN. – play only the trailer in Amazon Prime contents, and selected promotion video contents. Connect Amazon Fire TV to a VPN Network. There are few ways to connect your Amazon Fire TV to a VPN network. The best way is to use a VPN router and connect it to your Amazon Fire TV with a LAN cable. PureVPN and PrivateInterneAccess are two VPN service provider that offer quality VPN service at competitive rates. The VPN speed is very much depends on your router, you can click the link above and check with these two service provider for further inquiry. 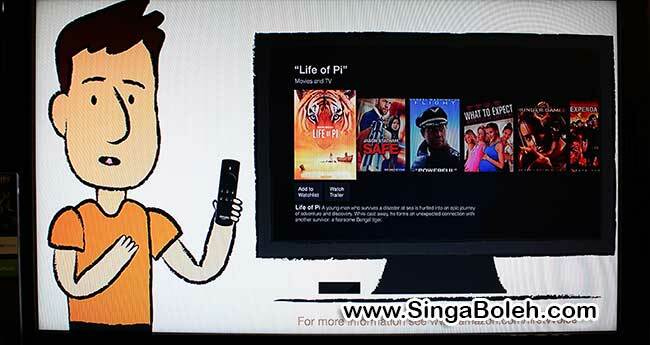 Do checkout our upcoming post on how we connect Amazon Fire TV to a VPN in Singapore. Once you have connected the Fire TV to a VPN network, and of course it have to be a USA server, then you can enjoy the full features of your Amazon Fire TV. 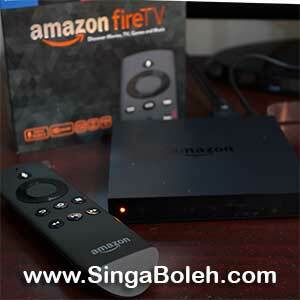 So, no worry that you cannot use Amazon Fire TV in Singapore or Malaysia. Amazon Fire TV Voice Search. We tested the controller voice search, it only applicable to Amazon Prime contents and to call out the apps. When using the voice search, you need to know the exact title of the movie you want to search in order to get an accurate result. Just press the microphone button on the controller and tell it what you want to search for. In the video, we tested the voice search for ‘Ironman 3' through Singapore accent's English. At first, it shows ‘Hi Inman Three', ‘I Am In Three' and ‘Hi Inminente Three'. You may need some practices on this, we did it right on the second attempt. YouTube App on Amazon Fire TV. We tested the YouTube video. Due to the limitation of Amazon Fire TV's voice search, you cannot use the voice search to search for YouTube video. Instead, you can use the ‘Search Faster' feature in the YouTube app, this allow you to find YouTube video with your mobile device or laptop and watch them on the Fire TV. Simply pairing your mobile device by visit youtube.com/pair on your device and enter the code provided on the screen. In the demonstration video, we use the Amazon manual search instead, you need to press the navigation button on the controller to select the alphabets, luckily the search function is smart enough to predict what you are searching for. The video quality will automatically be adjusted to High Definition after you play the video. Amazon Fire TV as Game Console. We also tested the game play, we were using the default remote controller because the Amazon Fire Game Controller is still on its way. Given the specification of the Amazon Fire TV, the game video quality is very impressive, and the game ran smoothly. 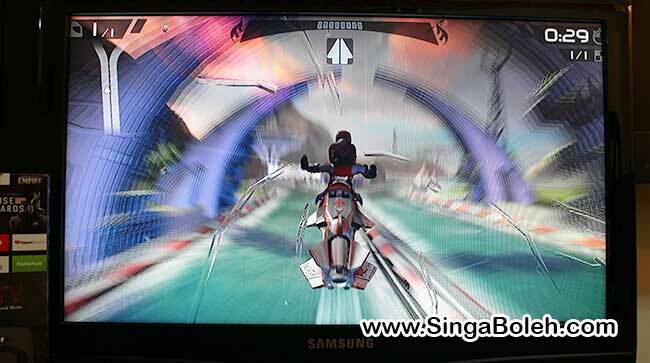 However, the remote control may not be very ideal for game play, most of the control lie on the navigation button which we felt that it is too big if you want to control the movement using only your thumb; and if you are controlling using two hands, it will be too small to hold. Although Amazon Fire TV may not be comparable to those high-end game consoles like Playstation 4 and xbox, it is still a very decent piece of game console for your family members because of its small size, easy operation and high performance. Games titles are easily available on Amazon’s Android App Store. The Fire TV allows you to connect up to 7 game controller for multi-players gaming, it can be a mixture of Amazon Fire Game Controller and the remotes. The Amazon Fire Game Controller will definitely complete the gaming experience on Amazon Fire TV. If you order the Game Controller before 2nd May 2014, you will get 1,000 Amazon Coins (equivalent to US$10) and Sev Zero game title worth $6.99. Something Interesting for Future Developments. Although the Amazon Fire TV is built on Android platform, at this point of time, you can't really install your existing Android onto the Amazon Fire TV. There is a USB 2. port behind the device but you cannot use it to load anything onto the device. There is not much controls in the settings menu, there is no VPN settings for you to get connected to a VPN network like Kindle Fire HDX, but there is an interesting feature, that is ‘Developer Options: ADB debugging'. If turn on, it will enable ADB connection over the network. Warning: This will allow anyone on your network to install applications from untrusted sources. So, we do expect that there will be some interesting developments on the USB port and the ‘Developer Options' in the future, either by the Amazon or third party. Updated: you can now install 3rd party app onto Fire TV, refer to this post. That's all for our initial hands on and demonstration reviews on Amazon Fire TV setup. We may be doing more post on this topic if there is a demand in future. If you have time (it is a 30 minutes video), you can refer to the below video demonstration. Apologize for the no-sound video because it was shot with a malfunction iPhone ;-). Do checkout this link for the latest price of Amazon Fire TV. Lastly, if you like our post, do share it to your friends via Facebook and Google Plus.